Fantasy Freaks Forum :: View topic - How do you write your outline? How do you write your outline? Post subject: How do you write your outline? That's about as structered as they got. Mind you, I love the spontanaity of the creative process and I don't think that everything should be planned. However, I've come to the point in my life where I really want to write as a career and I appreciate the need for some structer. So, my delightfully freaky friends, what do you think? I think as you go along, you will work out your own way Grasshopper. When I write half the time it starts off with a random idea, which I then develop as things go along. Other times I have a rough idea of where I want to go and work it out in detail as I go along. I tend to write notes at the bottom. Still, it's each to their own. I think the important thing here is that you can plan forever, but until you actual start writing, you're not going to progress far!! I think the mandibles make the graphic. It is a great idea though. That's an interesting way of doing it. I just kind of wrote stream of consciousness for my outline, so when I'm done and ready to send into TOR, I just need to edit that a little and it's ready to print and send. Luna, if you haven't already you should totally check out a book called the writers journey. It basicly talks about how to plan out a story and might help to define some ideas. I really hated the book when i first read it cause I thought it was trying to piegon hole my creative process, but once I got over myself and took the book with a grain of salt it has helped. It got me out of my big block. I am still a little blocked mind you, but i've been world building and thinking about my plot outline. Once i've got some more thougth put into it i will prolly post a tenative outline. might be a few more years though cause writting keeps getting pushed farther and farther down my list of priorites. any way, check out the book it is neat. I will most certainly put it on my to-buy list. I recently read a very good book about writing called, Bird by Bird by a woman named Anne Lamot. It was very worth it. I've also ordered Sometimes the Magic Works by Terry Brooks. In highschool, I was a bit of a snob about reading books about writing. I thought I knew it all. Now, as I've gotten older and have been faced with the harsh reality of the difficulty invovled in writing a book, I appreciate authors who take their time to write about their individual process greatly. The wonders of the internet. I read it and liked it, it wasn't too wordy and was useful. *squints and tries to remember* There's this really good book on writing fantasy in our university library... possibly "Writing Fantasy and Science Fiction"... oh, I give, I'll look it up for you..
Quite honestly, my writing style reflects my style of reading, playing games or watching anything, it really depends on the characters. I LOVE characters. Usually I start thinking of who I want for the main character, draw them, think about it more, what I want them to do or who I want them to be, draw some more, and then flesh the plot and side characters from there.. Character building really is the most spifftastic part of the writing process. Character building I can handle. Forcing my but down for more than an hour to write...now that is a challenge. Especially when you're a Luna Raven. Finding time to write when my brain is not mush is my biggest challenge. I'm happy to get a few hours a week in right now. ~If he works for you, you work for him. I think that after this last writing project, my brain is officially puddy. It might take a while for me to be able to jump back onto the writing wagon. Well, not including fan fiction. But you don't really need to wait for a mushy brain to reform inorder to write fan fiction. Hmmm. Well, everyone's different, so what I do may not work for everybody. I for one like to have a little bit of planning, and then let the characters drive the story. Once I started writing my first novel, I slowly noticed that the characters were helping me write it. Strange, I know, but true. My outline was completely blown away within months of writing the book and had to keep adjusting as the book evolved. I am a very visual person, so I had to get "in the zone" and actually visualise everything that is happening. Then I conveyed that into words. It's very hard to plan an outline when you write the way I do. But, you are still able to do it. I wrote plot points and interesting ideas that came to me in (sometimes odd) places of inspiration. Then when it fit, I used that idea. And sometimes the idea got scrapped because I could feel that I was writing againtst the grain. My advice is, try not to think "too much" about planning ahead, and enjoy writing what is happening in between. I find that... I write an outline and then I start writing and things change and inspiration hits and suddenly the outline is working against me and so must be changed... I've found it better if I have a vague idea of direction and try to stick to it, it works ok but may still need revising at a later date. However, often what needs changing are the bits that never felt quite right in the first place! Pretty sure all writers find their own little way of outlining. For instance, I am a much better speaker than a writer. So when I want to write something, I do a very very limited plot summary on paper with characters tagged in. Then, I pick a character and just start talking about them. I tell everything I can about them until I'm done with each of them (all the while either writing it down or tape recording it). After that I go back over the main characters to find additional important characters and do the same thing. The whole process generally repeats itself 3 or 4 times for smaller works. By the end of it I basically have an entire rough draft that's just been split into the perspectives of several characters. I'm not a very creative person, so I don't tend to write very often. I have written quite a bit of (absolutely horrible, mixed with some stuff that was well received) fanfiction, but I only have one story idea in my head. As far as the fanfiction goes, it's short so it's easier to write. I have to take it a chapter at a time, and I never know exactly where I want it to go. I do however make generalized outlines of each chapter, you know. But my actual story... I only know the first chapter. A good friend once used the analogy that I was sitting at a tavern with my main character, listening to him tell me his story so I could write it down... And that fits with how I feel about it. But so far he's only told me the prologue and part of the first chapter---and the prologue isn't detailed, and he only told me about it with in the last few weeks. I still haven't even gotten the inspiration to write it down. I can't say I am an author or that I am even speaking from experience but I enjoy a story that is interlinked. Write my first chapter to introduce the setting or main character and set the scene. I don't think that the first chapter has to be a plot device. It is meant to paint a picture in your mind. This gives you the opportunity to start and feel like you have something. Once that is done I would think about what I want my characters/world to accomplish in the story. I would then draw up a big time line. I would put the goal at the end and then start adding additional events along the time line. These events would start out as things I want to write about and include in my story. Once I have a few big events/milestones on the time line I could then start considering what sub plots/event would be required to lead up to these bigger events and add them to the time line. Once I have a general idea of what is going to happen I can then draw a second parallel time line for any antagonistic forces. This would allow me to get a picture in my mind of what actions would be going on behind the scenes and build a bigger picture of the overall progression. I could go even deeper and make a time line for each character/group of interest. This whole time line thing would be a living document that would no doubt change and grow as the project develops. However one main benefit to this method would be that if I got writers block with what ever I am doing I could just start writing about one of the other events to keep things moving and clean the cob webs. I think I would also draw some kind of map. Not to be clich� but rather to get a sense of scale. If I have a map and the world has a physical form then I can quickly comprehend what my characters would encounter while traveling from point a to point b. I could also use this to figure out just how long it would take them to ride/walk/fly what ever from one location to another. This also would then let me space my events better on my time line. Like I said. I've never written a story but that is how I would appoach it. I've tried before to write without a sense of structure, but I would quickly get frustrated with having to stop in the middle of scenes and think about the origins of a race, or a name of a new person. So I started to roughly use the snow flake method. At first I thought that it was going to choke all the creativity out, but I soon realised it was just a way to foster it and organize it. I have found it very helpful. It's all about taking it a little bit at a time and keeping the momentum going. The website it is on is www.advancedfictionwriting.com. A couple of notes. He is a fiction not a fantasy writer. When you get to the character synapsis part, you will probably need to do something similar for all your different races, and then places that you are planning to write about. It also says to do a scene spreadsheet, which I am finding rather helpful. What this in turn makes happen is that your novel will be character driven. They will be telling you what scenes need to be in the book and what they are going to do. By the time that you get to your first draft, there probably won't be a lot of changes to the plot line. You can just sit down and let it flow because you know where you are going. I can attest to the fact that it makes a much finer first draft. But in addition to the snowflake method...I have decided that I need a timeline of the general history, as well as a map for the reasons stated in the above post. I know at times it seems like the creative process could go on forever, but it does almost end at a point. Remember people this is fantasy writing, about 100 times more complex than regular fiction. Be patient with yourselves and enjoy the process. I do a couple different things. First I figure out what the problem is and what the obstacles in the way are. 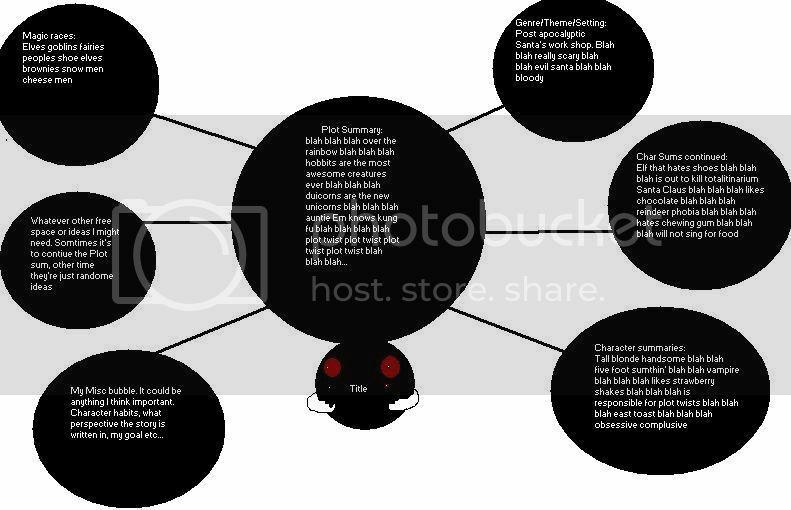 I then look at the character arcs - how each character is going to change over the corse of the story. Then I try and write a descriptive title for each scene, in order from the start to the finish. With that done I start writing. It gives me the freedom to let each scene play itself out, but at the same time gives me a purpose for the scene and a direction.